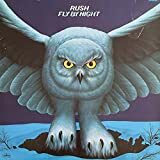 ‘Fly By Night’ is the second album by Canadian rock legends Rush. Released in 1975, it’s the first album to feature drummer Neil Peart, and solidifies what is the definitive Rush line up, with bassist/vocalist Geddy Lee and guitarist Alex Lifeson, holding up all the way to the bands retirement in January 2018. However, I don’t think this album is as good as the band’s debut. While there’s a few good songs, and Neil Peart’s drumming has lots of small touches that make him stand out from his predecessor, John Rutsey, I just struggle to really get into most of these tracks. That’s not really a knock on the band though. I love Rush, especially their 80’s synth-driven era, and their self-titled debut was a solid hard rock album. But ‘Fly By Night’ just doesn’t quite work for me. It’s easy to hear the progressive elements coming into the trios sound, and the musicianship itself is fantastic. I’d just prefer to listen to ‘Grace Under Pressure’ or ‘Signals’ instead. So what songs do I like? ‘Anthem’ is catchy, as is the title track and ‘Best I Can’, and there’s the soft, folk-inspired ‘Rivendell’ which I didn’t like initially but eventually it came to grow on me. But from a band with such a wealth of material to choose from, I can’t see myself coming back to these very often. Rush are one of my all-time favourite bands, and with a career spanning over 40 years, there’s bound to be a couple of albums I’m not too keen on. This is one of them. There’s no specific reason, but they have so many other albums that I prefer much more over this one. Simple as that. Sorry guys! "Fly by Night" is the 2nd full-length studio album by Canadian progressive rock act Rush. The album was released through Mercury Records in February 1975. A lineup change has occured since the 1974 self-titled debut album as drummer John Rutsey left Rush shortly after the debut album was released. He was replaced by Neil Peart, who also toured with Alex Lifeson (guitars), and Geddy Lee (bass, vocals) in support of the debut album. Neil Peart would immediately start contributing lyrics to the band´s music, and he has written all lyrics on "Fly by Night", except for "Best I Can" and "In the End", which were written by Geddy Lee. Compared to the Led Zeppelin influenced hard rock of the debut album, the music on "Fly by Night" is slightly more sophisticated and varied. There´s still a strong hard rock foundation in the music, but it´s obvious the band were interested in moving in a more progressive direction. So "Fly by Night" features both hard rock riffs and driving rhythms as well as more intricate details. The 8:39 minutes long mini-epic "By-Tor & The Snow Dog" is the most obvious example of the band´s newfound progressive rock direction, but it´s not as such representative for the rest of the material featured on the album. The change on the drummer position is heard throughout the album. Rutsey was arguably a well playing hard rock drummer, but Peart has a few more tricks up his sleeve. His slightly fusion influenced drumming style and occasional experiments with time signatures bring a new more sophisticated dimension to the band´s music, although he can also rock hard when that is called for. The musicianship is generally of high class on all positions though. Geddy Lee is not only a skilled and distinct sounding vocalist but a brilliant and quite busy bass player too, and Lifeson delivers both hard rocking riffs and well played solos. It´s on this album his chord progressions also began going down other roads than the debut´s predominantly blues based hard rock progressions. It´s a combination of the two here though. "Fly by Night" is a very well produced album, featuring a powerful, organic, and detailed production, which suits the material on the album perfectly. The songwriting on the 8 track, 37:57 minutes long album is overall of a good quality too, and although some tracks don´t stand out as much as others, it´s an entertaining album throughout. Highlights include "Anthem" and "By-Tor & The Snow Dog", while Rush probably shouldn´t have ventured into fantasy ballad territory with "Rivendell", which doesn´t really work that well and also feels a bit out of place on the album. All things considered "Fly by Night" is a quality release though and a 3.5 star (70%) rating is deserved. 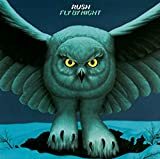 First RUSH album with drummer Neil Peart, "Fly by Night" is also the first one to clearly feature progressive passages and to shape the style that will become the trio's future musical trademark. The songs are overall in the same catchy 70's hard rock vein than its predecessor's, but some tracks are more elaborated and varied, alternating soft and aggressive passages. Furthermore, new themes are addressed, such as heroic fantasy. This evolution is partly due to the arrival of Neil Peart. Already an highly skilled drummer, his play style increased the complexity of the songs' rhythmic sections. He also wrote most of the lyrics of this record. The first side of the disc is the best. The thundering "Anthem" is simply a great powerful opener. Nearly heavy metal, it sounded quite aggressive for the time! "Best I Can" and "Beneath, Between & Behind" are more conventional hard rock'n'roll songs, pleasant and punchy. However, the highlight here is undoubtedly the 8 minutes mini-epic "By-tor And The Snow Dog". Longest track of the album, this song is one of the progressive passages of the disc as well as one of RUSH's first inclusion of fantasy lyrics. Displaying the musicians' skills, it alternates various soli, rhythm changes, different ambiances and even surprising instrumental passages with a space rock feel! This complex composition clearly announces announces RUSH's future musical direction. Very cool! The second side is unfortunately less convincing. The autobiographical title track narrates Neil Peart's experience when moving from Canada to London as a young musician. The tune is overall average and a little repetitive. "Making Memories" is a semi-acoustic folk piece that can remind LED ZEPPELIN III at times. Not really remarkable, but enjoyable. The other song taking inspiration from fantasy is "Rivendell", referring Tolkien's "Lord of the Rings". Looking promising, this fully acoustic ballad is finally soapy and lengthy. The record finishes with "In The End", a pleasant soft piece mutating into a slow heavy rock. The best track of this second side. "Fly by Night" is the release where RUSH slowly begins to craft its identity, by showing the members' mastership in their respective instruments. Combined with energetic hard rock and catchy melodies, complex structures and rhythm breaks will be the musical signature of the band for the years to come. As one of RUSH's most uneven album from the 1974-1984 period, this second opus is nonetheless enjoyable and contains powerful passages. Not the one to start with for newcomers, but recommended for fans. "Fly By Night" is the second studio album from hard rock/progressive rock band Rush. "Fly By Night" marks the first appearance of drum virtuoso Neil Peart in the band due to the departure of original drummer John Rutsey, who had left because of his diabetes and dislike of touring. Listening to the album, you can already hear a change in the music and lyrics. The music is still rooted in heavy blues rock like the debut, but there is quite a bit more variation. An influence of folk music is heard in songs like 'Making Memories' and 'Rivendell', the former being a really nice catchy folk-rock tune. The latter, however, is an incredibly boring ballad that really goes nowhere. It actually makes me yearn for the filler of the debut. On a more positive note, heard here is Rush's first epic, 'By-Tor and the Snow Dog', which has a great deal of experimentation with guitar distortion and some really sweet guitar and drum soloing. Mix that with the catchy bassline and it's a winner. Towards the end of the song, there is some dark ambiance that fits in well after the middle jam. While some of the experimentation works well, My favorite is easily the opening 'Anthem' which is a giant slab of heavy rock/metal that just hits you in the face. Lifeson's riffs on this song are absolutely killer, combined with Lee's raw vocal performance and Peart's chaotic drumming just makes this a real treat to listen to. Speaking of guitar, Lifeson cranks out catchy riff after riff in the first three songs on the album. Another one of my favorites is actually the previously mentioned 'Making Memories', it's simply just such a feel-good song for if you're feeling down. Along with drums, Peart also took over many of the lyric-writing being responsible for such fascinating and interesting lyrics that would be characterized in following albums. The lyricism has almost entirely changed, with fantasy lyrics in songs like 'Rivendell' and 'By-Tor and the Snow Dog' and more philosophical lyrics as heard in 'Anthem' and 'Beneath, Between, and Behind'. Overall, while there are some awesome songs and good ideas on the album, I don't feel like it's as strong as the debut. It has some filler, and besides 'Anthem', I don't find it to be as addicting as the debut. Despite the filler and certainly feeling like a transitional album, it's still a great album and I recommend it to any fans of 70's hard rock. Also, that album cover is awesome. Hope you found this review helpful. RUSH made the leap from just a hard rock band to the progressive rock band that would conquer the world with their 2nd album FLY BY NIGHT. The talented Neil Peart took over not only drumming duties but also became the lyricist leading the band into the fantasy world for inspiration. Also prevalent is the influence of the philosophy of Ayn Rand. This album starts out really strong with the feisty rocker “Anthem,” but although the complexity of RUSH's prog side had taken bloom, clearly their songwriting skills were not quite yet honed to the point where their longer pieces were interesting. I have always loved the shorter songs on here like the title track but tracks like “By-Tor And The Snow Dog” and even “Rivendell” just sound goofy and struggling to find their proper expression but fail miserably in the attempt. Having said all that, not a bad introduction to the new RUSH that would remain the lineup up to the current day producing countless albums including masterpieces and duds alike. I actually prefer the debut album to this one since the debut is an interesting hard rock album and this one takes on more than it successfully delivers. Standing head and shoulders above the Led Zeppelin worship of the previous album, Fly By Night sees Rush create a first rough draft of their distinctive prog metal style. This is most apparent on the album's highlight, the multi-part epic By-Tor and the Snow Dog, which aside from a slow section towards the end is a great prog metal composition featuring some superb guitar work from Alex Lifeson. Of course, the transformation in the band's sound is thanks mainly to the presence of Neil Peart, whose more technically proficient drumming allows the band to explore more complex musical territory. But both Geddy Lee and Alex Lifeson give a superior performance this time around as well, the presence of Peart clearly boosting the band's morale and both founder members relishing the opportunity to show off their skills outside of a blues-rock framework. It isn't a perfect album, though; it occasionally suffers from muzzy production values and a residual tendency towards lightweight rockers (such as the forgettable Best I Can or Making Memories), and the faltering acoustic piece Rivendell is an embarrassing slice of Tolkien worship that's best forgotten about - not least because it stretches about a minute's worth of musical ideas over five minutes. Nonetheless, the album brings the band appreciably closer to becoming the dominant force they would become, so major-league Rush fans will probably want to pick it up regardless. 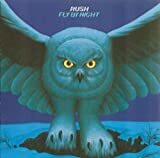 Fly By Night is the second of a long line of Rush albums and this is by no means a classic though has moments of greatness. Rush continued to play many of the tracks here live and they are bonafide fan favourites. Anthem became somewhat of an anthem for the band for years and of course the prog rock delicacies of By-Tor & The Snow Dog: I. At the Tobes of Hades; II. Across the Styx; III. Of the Battle; IV. Epilogue. This track really summed up what the power trio were about in these early years. They took risks and damn the consequences with this infamous 8 minute sprawling 4 part epic duel of banshees, hell hounds and dogs on glacial landscapes. The lead break of Lifeson on this is phenomenal as is the insistent creative drumming of Peart, joining the band and adding just the right flavour to the mix. The band would remain in this lineup indefinitely having shed Rutsey who moved on to greener pastures, and perhaps regretted that for an eternity. The band were about to be launched into the stratosphere with upcoming albums, but hindsight is a wonderful thing in rock. 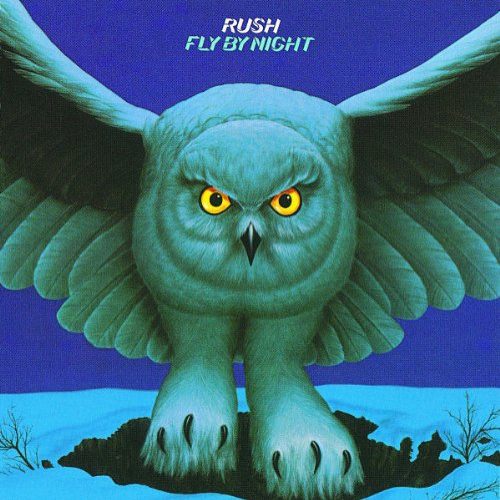 Fly by Night is the screechy title track with Geddy's high falsetto voice breaking glass. Throwaways such as Making Memories and Rivendell never do the album any favours, though it ends with a classic in the form of In the End. All in all an improvement from the debut but there was still a lot more left in the tank before Rush would break outside of Canada to becoming one of the greatest rock bands of the world. Rush can be said to have had a bit of a rough start, at least in terms of being progressive. However, in the matter of a few years, they went from a blues-rock Led Zeppelin clone, to a more musically intelligent body. Although 'Fly By Night' isn't amazing, it's a definite step forward in terms of complexity, and a sharp improvement from their epynomous debut effort. This new approach to rock music can be attributed to the arrival of their then-new drummer, Neil Peart. It was his lyrics that drove Rush from being rather typical in their content (the majority of Rush's 'love songs' are on their debut, which Geddy and Alex wrote the lyrics for.) Now instead of typical classic rock lyrics, we see ballads about mileaus from the Lord Of The Rings, and commentaries on the work of Ayn Rand. It is this intelligence that upgrades 'Fly By Night' from it's predecessor. While a lot of the songs on this album would still fit into the classic rock category, it's still a better brand of classic rock then was found on the debut. Songs like 'Fly By Night' and 'Anthem' are Rush classics. However, there isn't any material on the album that really shines. It's because of this that 'Fly By Night' is non-essential. Still worth picking up if you're a fan of Rush, though. No RUSH FLY BY NIGHT reviews posted by members yet.